One of several ways to reach Camp Alice, the bygone logging camp on the flanks of Mount Mitchell, is from NC route 128. From the parking area, follow the white blazed Mountains-to-Sea Trail (aka the Buncombe Horse Range Trail). The former rail grade carved in the 1900s contours the Black Mountains at 5,700 feet in elevation, making this moderate hike and long route appropriate for older kids. Along the way are streams, meadows, and stellar views. Walk roughly four miles to the clearing at Camp Alice and return the way you came. Navigate: From Mount Mitchell State Park (Blue Ridge Parkway milepost 355), follow NC 128 for half a mile to a pull-off at the intersection with the Mountains to Sea Trail. 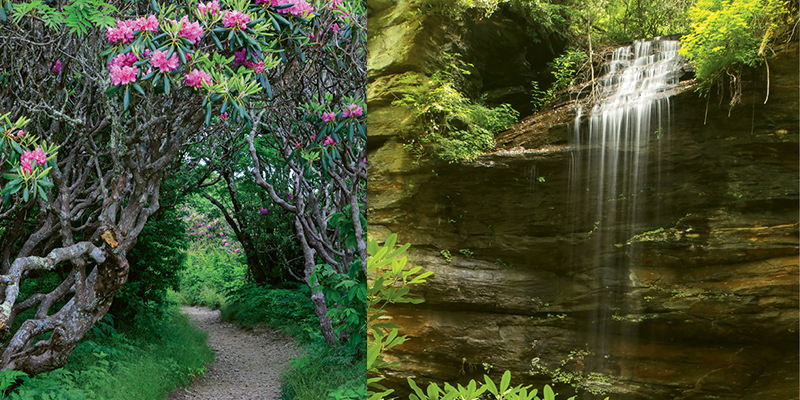 There’s hardly a better place for a picnic with a view than the grassy meadow of Craggy Gardens. The heath bald is an easy amble from the Craggy Gardens Visitor Center on the Blue Ridge Parkway through a high-elevation forest. The grassy clearing on the ridgetop is boarded by mountain shrubs and features fun places for kids to hide, spaces to run, and stunted trees to climb. Look for mayapple, violets, and flame azalea that bloom late at high elevation. Navigate: From Craggy Gardens Visitors Center (Blue Ridge Parkway milepost 364), the trail begins behind the stone wall at the south end of the parking area. Follow this one-way path, appropriate for all ages, gradually uphill to falls that spray over an impressive overhanging crag and flow to the Davidson River. The route is shadowed by large oaks, tulip poplars, and maples, and crisscrosses Moore Creek on wooden footbridges over ideal spots to splash in the stream or search for salamanders. Navigate: From the entrance of Pisgah National Forest at the intersection of US 64 and US 276 near Brevard, follow 276 north for 6.6 miles past the Pisgah National Forest stone entrance marker and park in the paved area on the right side of the road.